At the end of week #1 we are up to a total of 140 miles run for the MAF Marathon. That’s over 5 complete marathons! 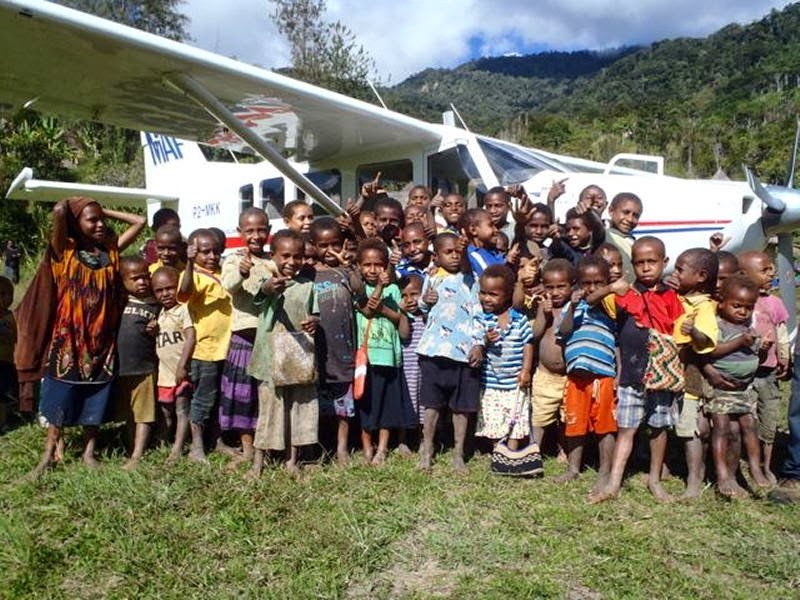 MAF PNG currently has 4 families based at Goroka flying two different types of planes, a Twin Otter as well as a GA8 Airvan. Like most of the bases around PNG Goroka has a wide variety of people and ministries they serve. The planes usually get loaded with cargo, building supplies, students, teachers, pastors, healthcare workers, missionaries, medical supplies, medical evacuation flights, and the list goes on. The Highlands grows most of the coffee crops in PNG and a lot of the coffee comes in to Goroka to be bought and sold where the buyers are. 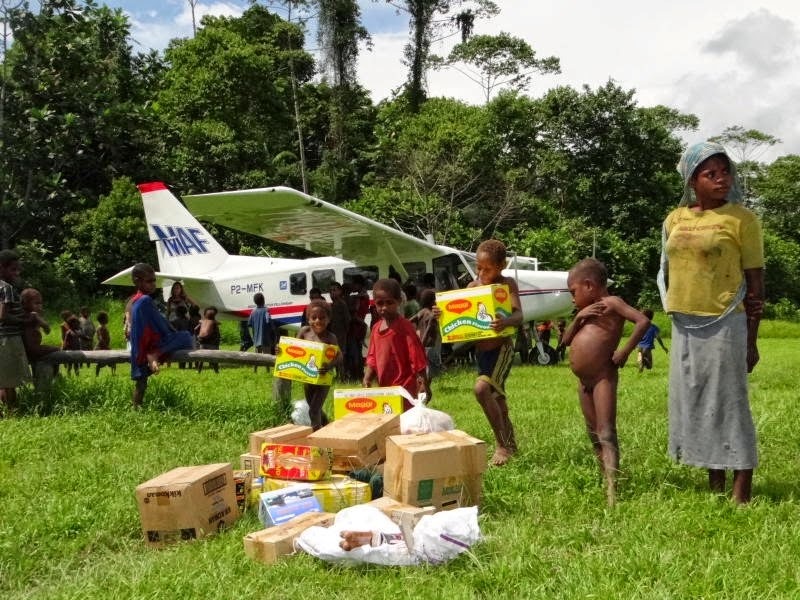 MAF helps the remote coffee growers get their crops to the place where they can sell them, so coffee is high volume cargo for the Goroka planes. The pilots at the Goroka base serve the Eastern Highlands and often head down to the Madang province to serve the coastal region as well as the Finisterre Mountain region. for airstrip conditions. With heavy rain in some areas the airstrips are in really poor condition, making it difficult to serve the people in those communities. We are thankful that the team is all back together here in Goroka after many months of staff being away on furlough. Please pray for the team, that there would be united and encouraged as they work to serve the Lord together in this, often, frustrating job. Many of the pilots in Goroka will be moving into new roles in the near future and learning new aircraft types. Please pray for wisdom and safety during training. Please pray for safety in the air as well as on the ground! That the pilots would have wisdom and discernment in all the many decisions that they have to make every day, that they would be alert and attentive to any issues that may arise, and mostly that they would be the hands and feet of Jesus shining a light into all of the places they fly. MAF Rumginae Base mainly serves the ECPNG* Hospital at Rumginae. This is the main reason we are here. Consequently, many of passengers are patients, health workers and doctors, and we fly a lot of medical supplies to outstations. Rumginae also has a Community Health Worker school with around 40 students per year, so we also fly these students in for school, home for holidays, and to outstations for their practical work experience. Rumginae is also home to a number of ECPNG pastors in leadership roles, as well as an SIL couple, and a missionary. Naturally, they fly with us if they go out to visit villages in the general North Fly area. In addition to all these, we also have the general travellers, government workers, teachers, and the occasional tourist. for the pilots at Rumginae and Kawito. Their workload is high and demanding, and there are often several medevacs a week. for the power situation at Rumginae. Inadequate power supply has been an ongoing problem, as the government has not supplied the service they promised. In the hot climate of the low lands fridges and freezers, as well as ceiling fans, are essential. Pray that a long time solution for providing reliable power can be found quickly. At present Kawito is a single pilot base operating a GA8 Airvan out of Kawito Mission Station in the Western Province. The majority of flights that we do are subsidised flights ie. for the church, medical or education workers. We would do at least two medivacs a week over to Rumginae Hospital (an hour and a half away). The Western Province is often thought of as the forgotten corner of PNG. There are no roads where we are, people walk, travel by boator plane. We are often the only contact villagers have with the outside world. The pilot regularly carries the Bible box with him as he flies around and, at the moment, is selling Bibles and resources as fast as we can stock them. People are hungry for the Word of God. In their down time the family shows a weekly movie at Kawito base, sells medicine, treats any emergencies who come to their door, teaches at the local Bible college and goes out to visit other villages when there is a chance. Pray for us as we have two new and inexperienced traffic officers starting work. Pray that we can create a working environment that is God-focussed with a servant heart as we serve the people of the Western Province. Pray for us as we move into the hotter time of the year. Pray that God will show us how He best wants us to use our time ie. what kind of other ministry to get involved in. Wewak is where MAF started its operation in Papua New Guinea in 1951. In 1968 MAF PNG’s headquarter as well as the whole engineering department moved to Mt. Hagen. Today Wewak is a small base usually operated by two pilots flying two GA8 Airvans, serving mainly the East and West Sepik Provinces as well as flying into Eastern and Western Highlands Provinces. Our customers are mostly from New Tribes Mission, Christian Brethren Church, Liebenzeller Mission, Evangelical Brotherhood Church as well as some other small churches. We regularly support the Oksapmin High School in Tekin with food, building materials or flights for their students and teachers. From Wewak we do weekly flights to Mt. Hagen and occasionally we serve the Kompiam community on our way as well. 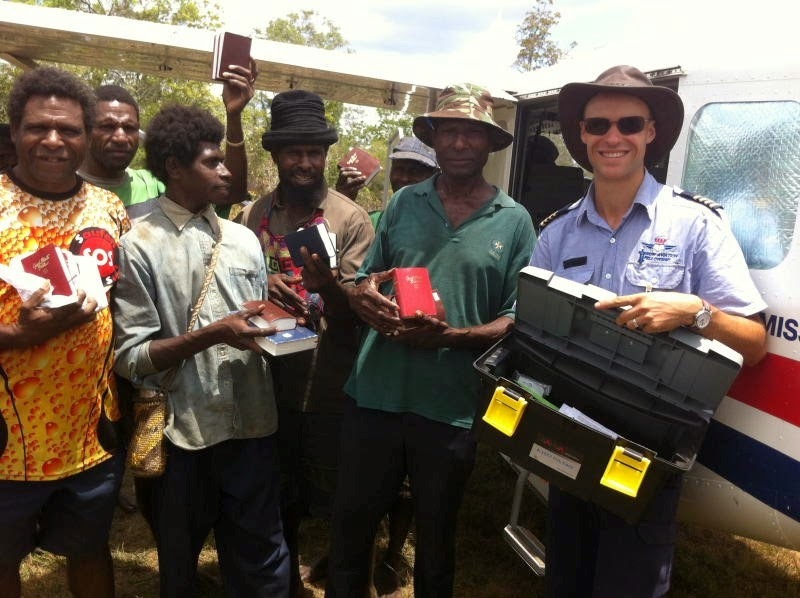 Like in the Western Province we carry printed and audio Bibles and Bible handbooks in our planes to remote communities. The demand is overwhelming. We usually run out of Bibles within two weeks. We serve some of the remotest villages in the Sepik area. Because of the big and mighty Sepik River, many other smaller rivers and huge swamps, there are no roads south of the river, hence no ambulances. If someone gets sick they need to travel by canoe for two or three days to a place called Pagwi where they could catch a PMV (Public Motor Vehicle) into Wewak. That means an additional 8 hours’ drive. 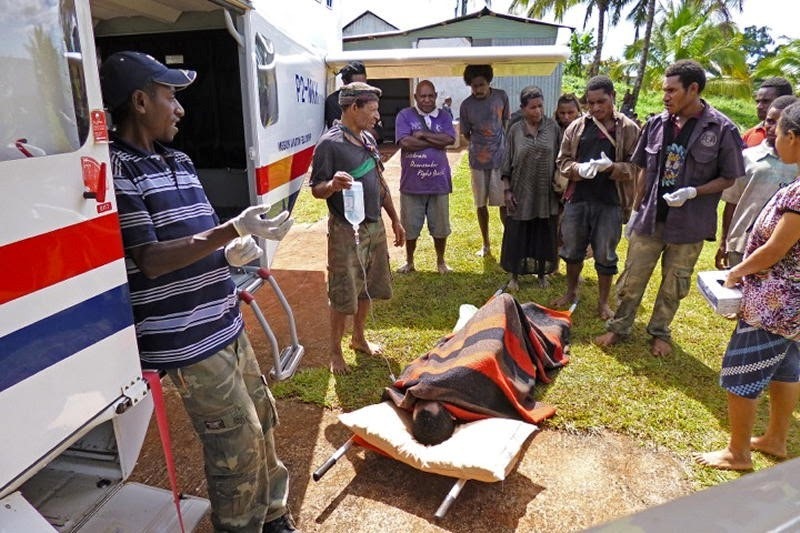 The preferable alternate is to get the patient to the nearest airstrip where one of our GA8s can pick them up and fly them to the hospital in Wewak within one hour. for a continuous supply of Tok Pisin Bibles and handbooks and that God’s Word really makes a difference in the lives of the people in those remote communities. for the coming Christmas period, when we are really busy flying many Bible school students and teachers back to their families for the Christmas holiday break. for safety while flying, as the weather is changeable at the moment and flying to airstrips in the Highlands gets more challenging as clouds close over valleys and gaps, and winds are picking up. Hey guys! Great work with the run, keep it up! Just wondering, is 140 miles the total of what each person has run put together?